The thymus is a soft, pink, bilobed gland enclosed in a connective tissue capsule and located in front of the aorta and above the heart. It lies behind to the upper part of the sternum (Figure 1 and 2). The thymus is in a part of the chest known as the mediastinum, the space in the chest between the lungs that also contains the heart, part of the aorta, the esophagus (the tube that connects the throat to the stomach), part of the trachea (windpipe), and many lymph nodes. The medulla is the innermost part of the thymus. The cortex is the layer surrounding the medulla. The capsule is the thin covering over the outside of the thymus. The thymus is usually proportionately larger during infancy and early childhood, reaching its maximum weight of about 1 ounce during puberty, then slowly shrinks after puberty as it is gradually replaced by fatty tissue. In elderly people, adipose (fatty tissue) and connective tissues replace lymphatic tissue in the thymus. The thymic lobules house many lymphocytes. Most of these cells (thymocytes) are inactive; however, some mature into T lymphocytes (T cells), which leave the thymus and provide immunity. Epithelial cells in the thymus secrete hormones called thymosins, that affect the production, differentiation of certain white blood cells (lymphocytes) and stimulate maturation of T lymphocytes. In this way, the thymus plays an important role in immunity. Lymphocyte production begins during fetal development and continues throughout life, with red bone marrow releasing unspecialized precursors to lymphocytes into the circulation. About half of these cells reach the thymus, where they specialize into T lymphocytes or T cells. After leaving the thymus, some of these T cells constitute 70% to 80% of the circulating lymphocytes in blood. 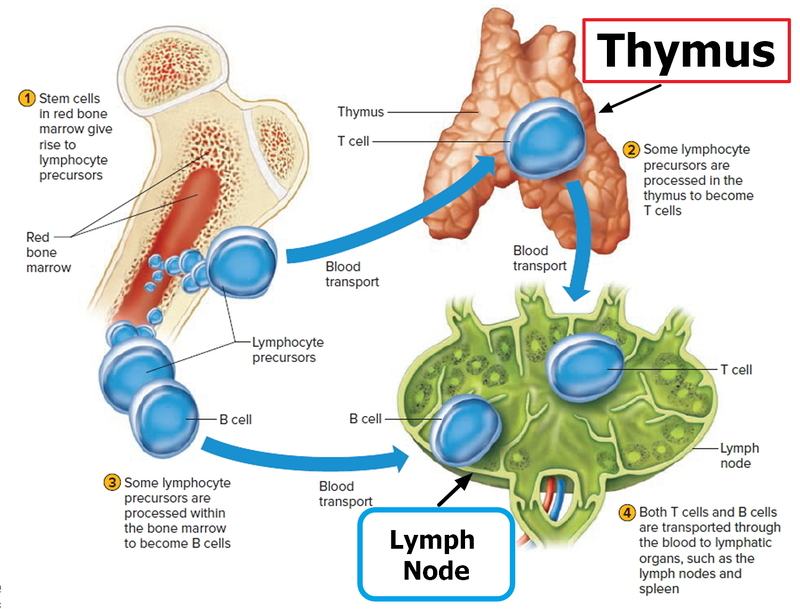 Other T cells (T lymphocytes) reside in lymphatic organs and are particularly abundant in the lymph nodes, thoracic duct, and white pulp of the spleen. Other lymphocytes remain in the red bone marrow until they differentiate into B lymphocytes, or B cells. The blood distributes B cells, which constitute 20% to 30% of circulating lymphocytes. In addition, the thymus produces a hormone which has an immunotrophic effect, i.e. it endows cells having immunological potential with immunological competence. In humans it has been postulated that the tonsillar tissues may play an analogous role. Animal experiments involving extirpation of the immunotrophic lymphoid tissues have led to a better understanding of immunological deficiency diseases in man. A lymphocyte must be activated before it can respond to an antigen. T cell activation requires that processed fragments of the antigen be attached to the surface of another type of cell, called an antigen-presenting cell (accessory cell). Macrophages, B cells, and several other cell types can be antigen-presenting cells. T cell activation may occur when a macrophage phagocytizes a bacterium and digests it within a phagolysosome formed by the fusion of the vesicle containing the bacterium (phagosome) and a lysosome. Some of the resulting bacterial antigens are then displayed on the macrophage’s cell membrane near certain protein molecules that are part of a group of proteins called the major histocompatibility complex (MHC). MHC antigens help T cells recognize that a newly displayed antigen is foreign (nonself). Activated T cells interact directly with antigen-bearing cells. Such cell-to-cell contact is called the cellular immune response, or cell-mediated immunity. T cells (and some macrophages) also synthesize and secrete polypeptides called cytokines that enhance certain cellular responses to antigens. For example, interleukin-1 and interleukin-2 stimulate the synthesis of several other cytokines from other T cells. Additionally, interleukin-1 helps activate T cells, whereas interleukin-2 causes T cells to proliferate. This proliferation increases the number of T cells in a clone, which is a group of genetically identical cells that descend from a single, original cell. Other cytokines, called colony stimulating factors (CSFs), stimulate leukocyte production in red bone marrow and activate macrophages. T cells may also secrete toxins that kill their antigen-bearing target cells, growth-inhibiting factors that prevent target cell growth, or interferon that inhibits the proliferation of viruses and tumor cells. Several types of T cells have distinct functions. helper T cell proliferates and the resulting cells stimulate B cells to produce antibodies that are specific for the displayed antigen. Another type of T cell is a cytotoxic T cell, which recognizes and combines with nonself antigens that cancerous cells or virally infected cells display on their surfaces near certain MHC proteins. Cytokines from helper T cells activate the cytotoxic T cell. Next, the cytotoxic T cell proliferates. Cytotoxic T cells then bind to the surfaces of antigen-bearing cells, where they release perforin protein that cuts pore like openings in the cell membrane, destroying these cells. In this way, cytotoxic T cells continually monitor the body’s cells, recognizing and eliminating tumor cells and cells infected with viruses. Cytotoxic T cells provide much of the body’s defense against HIV infection. Some cytotoxic T cells do not respond to a nonself antigen on first exposure, but remain as memory T cells that provide for future immune protection. Upon subsequent exposure to the same antigen, these memory cells immediately divide to yield more cytotoxic T cells and helper T cells, often before symptoms arise. An accessory cell, such as a macrophage, phagocytizes the antigen-bearing agent, and the macrophage’s lysosomes digest the agent. Antigens from the digested antigen-bearing agents are displayed on the membrane of the accessory cell. Helper T cell becomes activated when it encounters a displayed antigen that fits its antigen receptors. Activated helper T cell releases cytokines when it encounters a B cell that has previously combined with an identical antigen-bearing agent. Cytokines stimulate the B cell to proliferate, enlarging its clone. Some of the newly formed B cells give rise to cells that differentiate into antibody-secreting plasma cells. B cell encounters an antigen that fits its antigen receptors. Either alone or more often in conjunction with helper T cells, the B cell is activated. The B cell proliferates, enlarging its clone. Some of the newly formed B cells differentiate further to become plasma cells. Plasma cells synthesize and secrete antibodies whose molecular structure is similar to the activated B cell’s antigen receptors. In general, antibodies react to antigens in three ways. Antibodies directly attack antigens, activate complement, or stimulate localized changes (inflammation) that help prevent the spread of pathogens or cells bearing foreign antigens. In a direct attack, antibodies combine with antigens, causing them to clump (agglutination) or to form insoluble substances (precipitation). Such actions make it easier for phagocytic cells to recognize and engulf the antigen-bearing agents and eliminate them. In other instances, antibodies cover the toxic portions of antigen molecules and neutralize their effects (neutralization). However, under normal conditions, direct antibody attack is not as important as complement activation in protecting against infection. neutralization of viruses by altering their molecular structure, making them harmless. Other proteins promote inflammation, which helps prevent the spread of infectious agents. Activation of B cells or T cells after they first encounter the antigens for which they are specialized to react constitutes a primary immune response. During such a response, plasma cells release antibodies (IgM, followed by IgG) into the lymph. The antibodies are transported to the blood and then throughout the body, where they help destroy antigen bearing agents. Production and release of antibodies continues for several weeks. Following a primary immune response, some of the B cells produced during proliferation of the clone remain dormant as memory cells. If the same antigen is encountered again, the clones of these memory cells enlarge, and they can respond rapidly by producing IgG to the antigen to which they were previously sensitized. These memory B cells, along with the memory cytotoxic T cells, produce a secondary immune response. As a result of a primary immune response, detectable concentrations of antibodies usually appear in the blood plasma five to ten days after exposure to antigens. If the same type of antigen is encountered later, a secondary immune response may produce the same antibodies within a day or two. Although newly formed antibodies may persist in the body for only a few months or years, memory cells live much longer. Naturally acquired active immunity occurs when a person exposed to a pathogen develops a disease. Resistance to that pathogen is the result of a primary immune response. A vaccine is a preparation that produces artificially acquired active immunity. A vaccine might consist of bacteria or viruses that have been killed or weakened so that they cannot cause a serious infection, or only molecules unique to the pathogens. A vaccine might also be a toxoid, which is a toxin from an infectious organism that has been chemically altered to destroy its dangerous effects. Whatever its composition, a vaccine includes the antigens that stimulate a primary immune response, but does not produce symptoms of disease and the associated infections. Specific vaccines stimulate active immunity against a variety of diseases, including typhoid fever, cholera, whooping cough, diphtheria, tetanus, polio, chickenpox, measles (rubeola), German measles (rubella), mumps, influenza, hepatitis A, hepatitis B, and bacterial pneumonia. A vaccine has eliminated naturally acquired smallpox from the world. The immune response can turn against the body itself. It may become unable to distinguish a particular self antigen from a nonself antigen, producing autoantibodies and cytotoxic T cells that attack and damage the body’s tissues and organs. This reaction against self is called autoimmunity. The specific nature of an autoimmune disorder reflects the cell types that are the target of the immune attack. In type 1 (insulin dependent) diabetes mellitus the target is beta cells in the pancreas. The tissues within the joints are targeted in rheumatoid arthritis. In systemic lupus erythematosus the target is DNA and proteins associated with it in the cell nuclei. About 5% of the population has an autoimmune disorder. Why might the immune response attack body tissues ? Perhaps a virus, while replicating inside a human cell, takes proteins from the host cell’s surface and incorporates them onto its own surface. When the immune response “learns” the surface of the virus in order to destroy it, it also learns to attack the human cells that normally bear those particular proteins. Another explanation of autoimmunity is that somehow T cells never learn to distinguish self from nonself. A third possible route of autoimmunity is when a nonself antigen coincidentally resembles a self antigen.